Recently on Google’s 15th birthday occasion Raj created this massive post on Google Easter eggs, which talked about some nice things you can do with Google search apart from Searching. 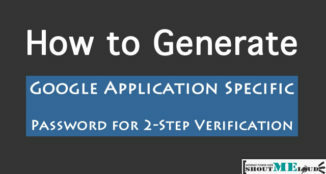 Google is one of those tech company, which is known for innovation and they never failed to surprise the entire internet community with surprises on special days. And this is what “Google in 1998” Easter egg is all about. 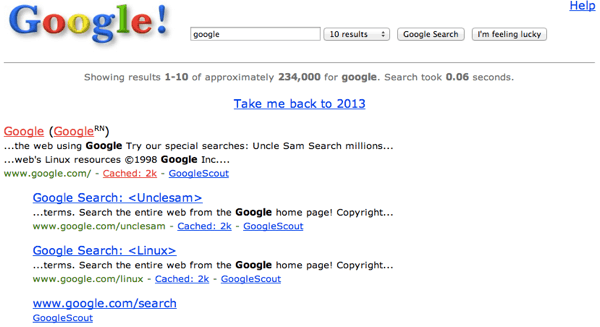 You can click on Take me back to 2014, to come back to the current version of Google search. Along with this Google also shared some new changes on their birthday, and you can check out the announcement over here. Above easter egg will only let you see initial version of Google, and if you want to see how Google has changed their design over time, a good way is using web archive, which I already mentioned over here. Using Web-archive, you can see how Google has changed the design over time ( there is not much of change you can notice). 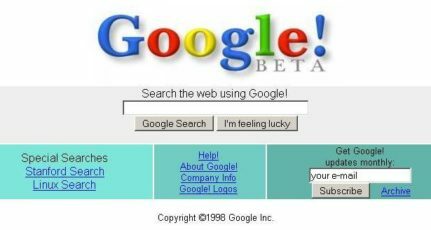 Over all “Google in 1998” Easter egg will let you take a spin of history, and it’s good to know how world popular search engine looks like in the past. Here is the direct URL to check out this easter egg. And don’t forget to share this cool easter egg trick with your friends, and give a warm birthday shout to Google. Its hard to believe that Google has been around for only 15 years. It has changed the way people think in such a short span of time. 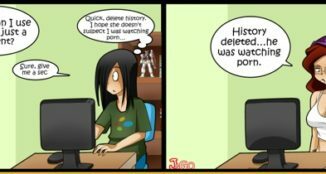 It has become an integral part of our everyday life and its hard to imagine life without Google. I guess before 15yrs which were just impossible to imagine even today all they are so easy to get.It’s all because of google.Google just made a revolution by connecting the whole world with it’s magical stick.Anyway just saw today’s google doodle,it’s great. Older Google..I was just wondering to see how the Older Google looks like at that time. Nice gift from Matt Cutts on Google’s 15th birthday. Google doodle was nice and i scored 182 !!!! !